1. How weird eggplant looks when it’s pan-fried. 3. How amazing it tastes, despite my doubts when I taste the sauce (before it bakes) and the weird resistance I feel using Parmesan cheese in an Indian dish. 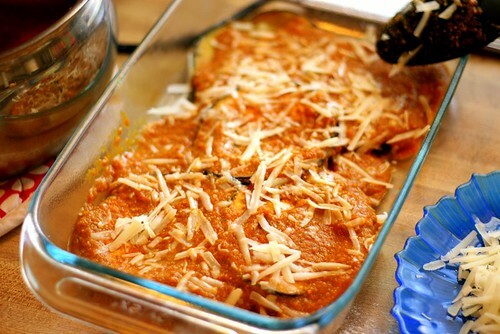 I like to think of this as the Indian version of Eggplant Parmesan, which I love. 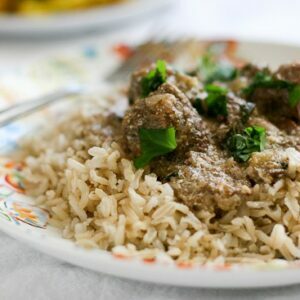 You must, must serve this with the yogurt sauce, which compliments the curry amazingly well. We also served this with additional cucumber slices and some pita bread. I don’t think I would put it over rice because it would dilute the flavors too much. 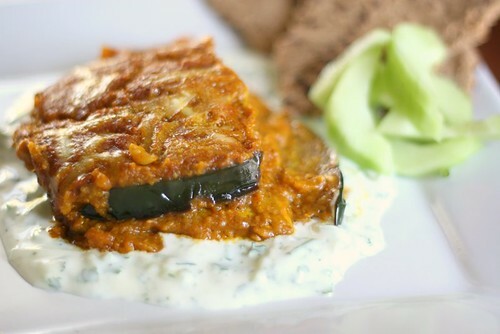 Eggplant Curry with Cucumber Yogurt Sauce is my favorite vegetarian curry! It's a bit of work to put together, but completely worth the effort. For the yogurt sauce, mix all ingredients in a small bowl. Season to taste with salt and pepper. Cover and chill until ready to use. TIP: can be made a day ahead. Meanwhile, heat 1 Tablespoon of oil in a large saucepan over medium heat. Add onion, carrot, tomatoes, 1 1/2 Tablespoon curry powder and remaining spices. Sprinkle with salt and pepper. Cook vegetables until soft, about 6 minutes. Add wine/broth; let some of the liquid cook off, another 3-5 minutes. (The original recipe said it would take two minutes until the mixture was "almost dry". Um, not the times I made it. Mine wasn't even "almost dry", but it wasn't as soupy as before.) Cool slightly. 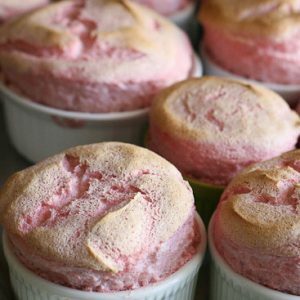 Preheat oven to 350 degrees F. Place flour in a shallow bowl. 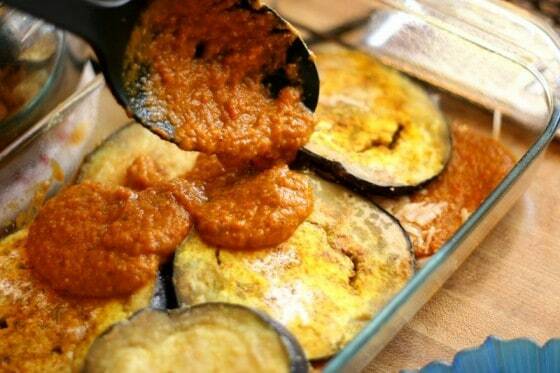 Pat eggplant slices dry and sprinkle with remaining 1/2 tablespoon of curry powder. Coat both sides with flour. Heat 2-3 Tablespoon of oil in a large skillet over medium heat. Working in batches and adding more oil as needed, fry eggplant for about 2-3 minutes per side, until golden brown. Transfer to a baking sheet. Lightly oil an 11x7x2 baking dish. Place about 1/3 of eggplant on the bottom of the dish. Spread 1/3 of curry sauce over the eggplant, then sprinkle with 1/3 of the cheese. Repeat the layering two more times. Bake until bubbling around the edges and cheese is golden, 45-50 minutes. TIP: Can be made a day ahead. Simply cool, cover, and chill. To rewarm, uncover and cook it for about 30 minutes at 300 degrees F.
Spread a little cucumber yogurt sauce on each plate and place a square of the eggplant curry on top of the sauce. Serve with sliced cucumber and pita bread, if desired. So after seeing this, I have the utmost confidence that you have DEFINITELY been holding out on us! It looks fantastic. Indian-Italian fusion? I'm so there. mmmm. yum. this is like an asian eggplant parmigiana. It's a great mix (with the cucumber yoghurt) and I can imagine this in a family sitting. 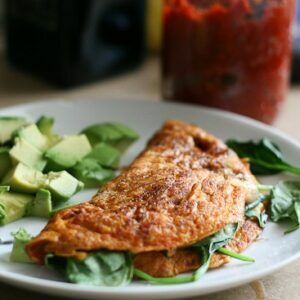 I'm itching to serve this with basmati rice, even! This sounds so delicious!! I would probably feel the same way about the parmesan in an indian dish… but the pictures speak for themselves! This really sounds like a wonderful and unique recipe! 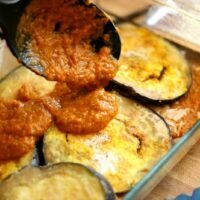 I love the idea of an Indian eggplant Parmesan, and the pictures look fantastic! Mika – Thanks for that link! I'm pretty familiar with kefir (my husband and I both spent a while in Russia), but never think to buy it here. They have it at Trader Joe's, but I always grab the yogurt instead. This is absolutely delicious but very time consuming,,,,,but again I say worth the time!! I read the ingredient list (no flour listed) and started to make this until I read the need for flour. I have celiac disease and am therefore on GF diet and had to figure out what to use. I used my coffee grinder and ground GF whole oats and that worked just fine for the flour. This dish is ADDICTIVE!! YUM!